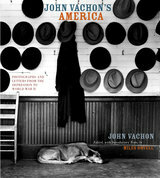 John Vachon (1914-75) began his long career in photography as a member of the famous Farm Security Administration group that included Dorothea Lange, Walker Evans, and Ben Shahn. The least-known member of the group, he worked for the FSA longer than any of the others, recording in his distinctive style the rural farms, the small towns, and the cities of America, as the country moved from the Depression to World War II. After the war he worked as a photographer for the United Nations and for LOOK magazine. Miles Orvell is Professor of English and American Studies and Director of American Studies at Temple University. He is the author of several books including The Real Thing: Imitation and Authenticity in American Culture, 1880-1940 (1989), American Photography (2003) and After the Machine: Visual Arts and the Erasing of Cultural Boundaries (1995); he is also Senior Editor of the Encyclopedia of American Studies (2001). "Standards of the Documentary File"
"Not a Care in the World"
"Tribute to a Man, an Era, an Art"